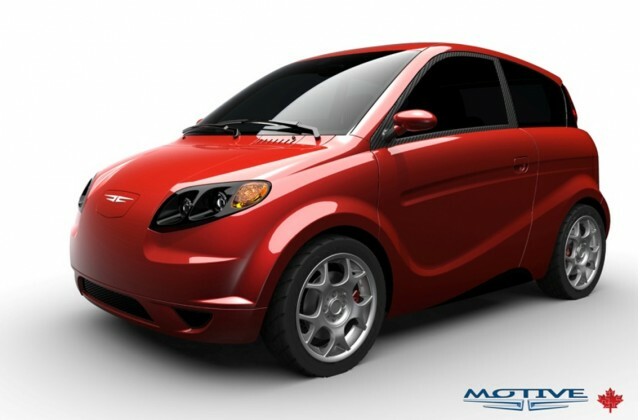 Sit back, relax, and take in the official design and specifications for the Kestrel, the hemp-bodied EV engineered by Canadian firm Motive Industries. We looked at the benefits of the environmentally friendly hemp construction last month, an avenue Lotus have also explored with their 2008 Eco Elise concept. Now we can see what the lightweight EV will look like. The swooping arches and modern features hide a 16 kilowatt-hour lithium-ion battery pack offering a range of 100 miles and a top speed around 84 miles per hour. Both these figures better the 2011 Smart Electric Drive we tested a few weeks back (on paper, at least) though Motive will only have running production prototypes in 2011. The light weight of 850 kilograms (1874 lb) no doubt helps the range and performance though, one of the benefits of the lightweight hemp bio-fiber body panels. The car should seat four passengers, though the interior design is yet to be revealed. Also yet to be revealed are Motive Industries' technology and manufacturing partners, though the consortium of 11 companies, coming under the banner of 'Project Eve', aims to 'bring together Canadian skills for the purpose of producing and supporting Canadian electric vehicles and components'. are recharged. As well as the Kestrel, the consortium is already testing a two-passenger EV, and intend to release a one-passenger three wheel vehicle, a small SUV and a delivery van. There's no word on whether the Kestrel has a future in the United States as of yet - the first sales will be to corporate or government fleets in Canada for beta testing, and public sales will depend on the success of these tests. If all goes to plan, production should begin in 2012. The company plans to seek foreign partners with whom they can licence the technology, so the Kestrel could become an international EV.